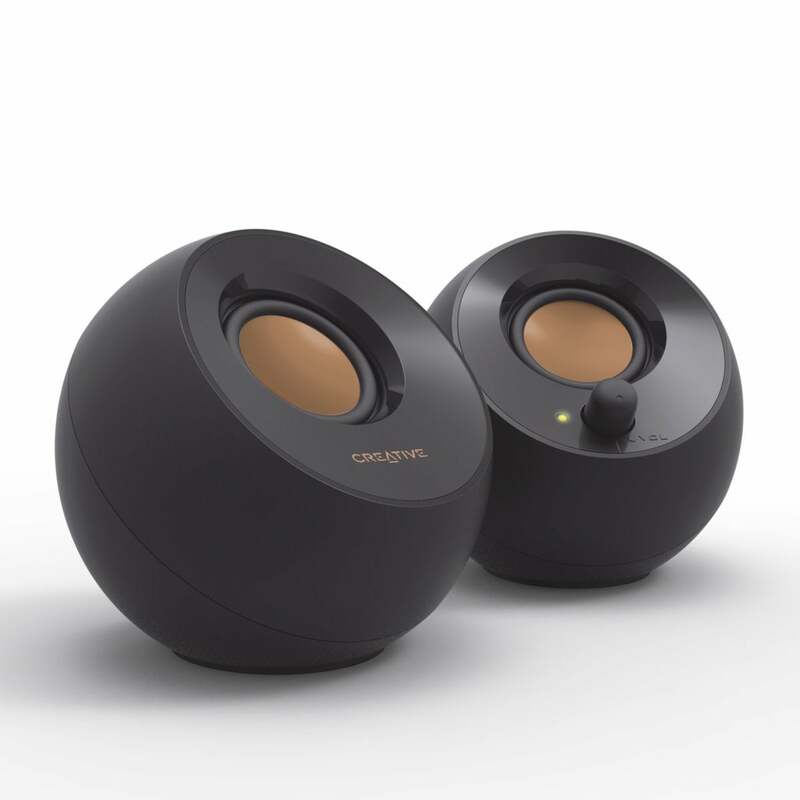 Creative says its Pebble speaker set was inspired by a Zen Japanese rock garden. This USB-powered 2.0 system has a simple, sparse design with a subtle aesthetic appeal. Still, I wondered how much audio enhancement they could bring to a PC for a measly $25 (on Amazon). Turns out, quite a bit, even compared to pricier budget PC speakers we've tested. Available in black or white (the price for white may differ slightly on Amazon), each speaker measures 4.5 x 4.4 x 4.6 inches (HWD) —about the size of an average grapefruit. The space-saving size makes it easy to find room for them on even the smallest or most cluttered desk. The rubber ring on the flattened bottom of each enclosure keeps it from slipping on your desktop. Pebble’s two-inch far-field drivers—which combine for an RMS of 4.4 watts— are angled at 45 degrees. This design is optimal for directing the audio at your ears when you’re sitting in front of your computer. Built-in passive radiators extend the low-frequency response for beefier bass. A power/volume knob on the front panel of the right speaker works in conjunction with your PC’s audio controls to manage Pebble’s volume. Pebble’s balanced, immersive audio belies its small size. With Bluetooth speakers becoming more the norm, contending with cables can feel like a hassle. Fortunately, Pebble keeps the wires few and tidy. The two speakers are hardwired together, so all you need to do is plug the USB cord into one of your PC ports, and the 3.5mm input into your headphone jack. Each of these cables is attached to the back of the right speaker, so you don’t need to worry about losing them. Pebble delivers surprisingly rich, immersive audio. USB-powered 2.0 speakers tend to suffer in sound quality compared to their AC-powered counterparts, but that wasn’t the case here. Highs were crisp and clear, and the bass had plenty of presence. The audio overall had depth and detail no matter what type of music I ran through the speakers. The tipping point for speakers this size is usually at higher volumes, where distortion becomes an issue. But even when playing bottom-heavy genres like dub or dance music, Pebble retained crystal clarity at high volume. Decent sound in sub-$30 stereo speakers is as rare as gold. Pebble sets a new bar with its well-above-average audio. It’s not audiophile quality—nothing at this price point is—but it’s fuller and more balanced than you find in PC speakers that cost twice as much. Pebble offers an inexpensive audio upgrade that’s tough to resist. 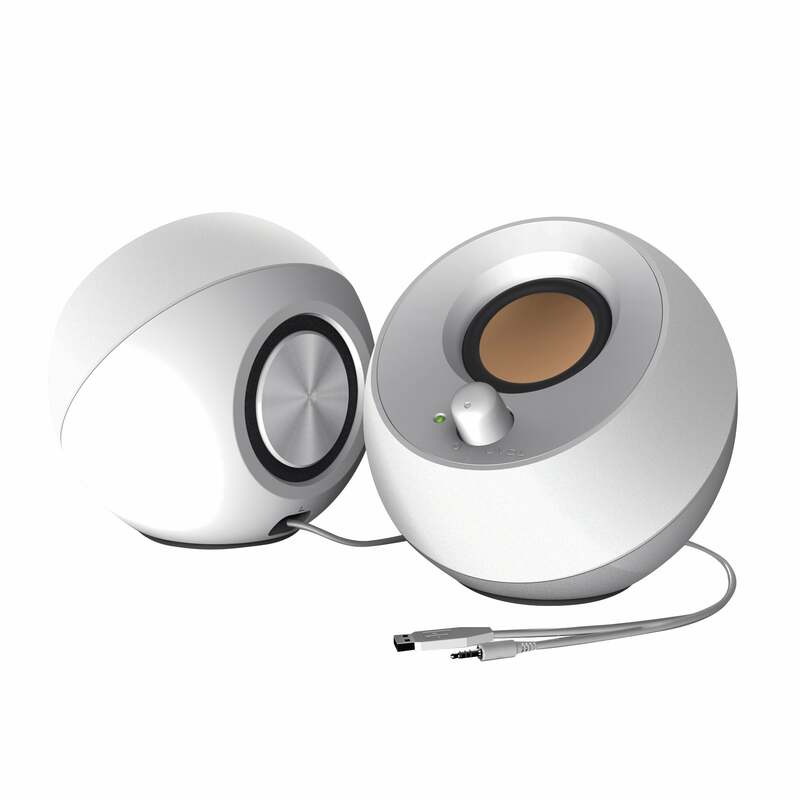 Creative's tiny Pebble speaker set offers an impressive audio upgrade to your PC at an irresistible price.